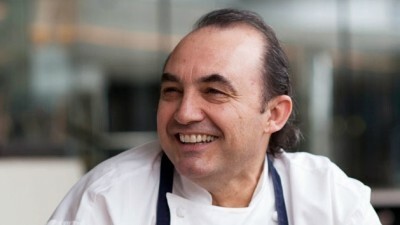 Stefano Manfredi is this month’s Chef in Action featured in SBS Feast Magazine . For the past 28 years, this leading Sydney chef has been making headlines for his modern Italian cooking with his iconic restaurants, bel mondo and Manfredi at Bells. From his latest glittering city outpost Balla at The Star casino, he shares some of the old favourites and the new inspired Italian classics. As a child, it wasn’t until I was invited to a school friend’s house for “tea” that I realised the meals at our place were different. Until then, I thought everyone ate risotto with saffron, and that dishes cooked with snails and frogs were the norm. One of my favourite meals was peperonata (braised capsicum with basil and onions), and I grew up watching my mum and my grandmother cooking it, first in Gottolengo, in northern Italy, where we’d forage for wild fennel, greens and mushrooms, and later in Australia. My family left Italy for Australia on my sixth birthday – Boxing Day, 1960. My dad hoped to find work here, and we settled in Western Sydney. Mum didn’t always have access to the same ingredients that we’d had in Gottolengo, but she continued to make the same food, gathering garden snails after the rain and carefully preparing them so they were safe to eat. I didn’t know it at the time, but learning to use what’s available locally was a good lesson, because even though I’m an Italian chef, I’ve always believed that my restaurants should reflect the place they’re in. My first job after university was as a teacher, but after a childhood spent eating such an amazing diet, I wanted to open my own restaurant. Instead of going back to school to train as a chef, I began working in other people’s kitchens, including Jenny Ferguson’s two-hatted restaurant, You and Me, on King Street in Sydney. It was there that I first saw the sort of ingredients that could be had in Australia. In the late 1970s, it was a fledgling industry, but there was still some quality produce to be found. When I opened my first restaurant in 1983, in a little laneway in Pyrmont, most people didn’t know what polenta was and hardly ever ate garlic. I think the fact that Australia’s restaurant culture has grown so much since those days to where it is now has influenced people’s knowledge and understanding of food, and is a big part of why there are now such diverse ingredients available in our supermarkets. My own cooking style has changed over the years, too. When I began, I strived to make sense of my Italian food here in Australia and tried to find ways to work other cultural culinary influences into my dishes. More recently, I’ve gone back to my roots to revisit older recipes, because as I’ve grown older, my tastes have become simpler. But why I cook, and the desire I felt to open Balla, hasn’t changed since I first wanted my own restaurant all those years ago. I’m endlessly inspired by the beautiful produce that growers and fishermen provide, and I get vicarious pleasure from my restaurants; I have a completely different experience compared to my guests, so where something is just hard work for me in the kitchen, by viewing it through their eyes, I can see how happy my restaurants make people. It’s the same when you have a dinner party at home – it’s hard work, but there’s nothing better than people enjoying it and thanking you for your food. Feeding people makes them happy and that’s my reward.